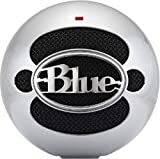 What did Blue put inside that wild-looking Snowball USB mic, anyway? How about two completely distinct capsules? Yep. You can sing into it, put it on you guitar amp, or just put the Snowball on its included stand and pretend you're sending signals back to your home planet. Podcast with it, record entire albums with it, and appreciate the fact that it plugs straight into your computer, via USB. That's convenience! You even get a handy 10dB pad, so your crazy-loud guitar player won't cause the mic to distort. It's round, it's white, it sounds like a million bucks, and it's right here, ready to ship. Get yours today or get left out in the cold!